This Hot Rodimus was my prize for winning the Shewsbury Land SLFV6A - Open Category (International) Digirama Contest, with my comic Cola Can. Thanks Shewsbury Land. This is my first Mecha style figure, so I don’t have much to say about the sculpting. I have never been a fan of Mecha’s because to me they are quite blocky, but I have seen some nice costume painted ones which make them look better, and that is what I hope to do with this figure. 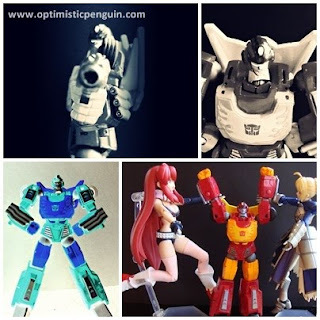 Anyhow, the sculpting is good, nice little indented features to make it look like a robot, joints are well designed into the sculpt of figure; accept in the elbows where the Revoltech joint stick out of the figure, see this image. But I will just cut them shorter so it doesn’t show as much. 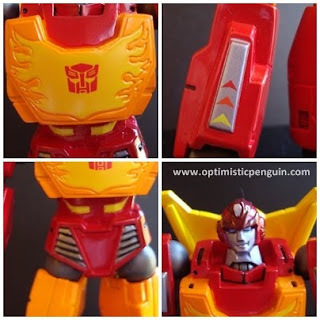 Hot Rodimus has some nice paintwork, though I am not a fan of the colour scheme. His paint is nice and shiny, with the gun metal coloured parts having a slight glitter to them. Nice detailing on this chest, with the transformer icon being perfect, also nice detail on his arrow parts, and black where bolts and bits are indented. His extra hands painted well, his guns are just plainly painted but with a nice glitter to them. Like I said above I am not very fond of the Red/Yellow/Orange colour scheme and I plan to have a go at costume painting my Hotrodimus, in blacks and gold, with some hints of silver, but we will see how that turns out. So it’s a 6/10 for paint. Starting at his feet, here he has Revoltech ball hinge joints but due to his lower leg design his feet can only move forwards a little way and turn in and out slightly. 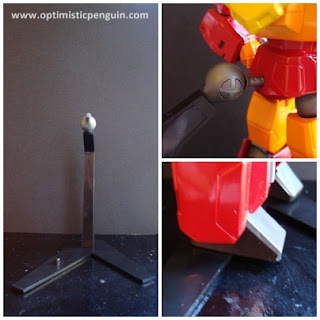 His knee has a Revoltech ball hinge joint and his knee bends naturally and his lower leg can turn in and out slightly. At his hip he has another Revoltech ball hinge joint so his leg can turn in and out bend forwards and a little way backwards and if you turn the joint in the hip part you can get his legs to go out sideways. Under his chest part he has another Revoltech ball hinge joint to lean forwards and back and to twist. His neck has a Revoltech joint so he can move it slightly. At his shoulder is another smaller Revoltech ball joint to give his arm full range of motion, at his elbow he can twist his arm in and out, and bend naturally. His hands are just on pegs and can twist around, but do not have a joint, as he doesn’t really have a wrist. A few things which would have made this figure amazing would be if the wheels on his shoulder were actual wheels and could move, and it his back plate, care bonnet had a joint, so you could make some ‘just transformed’ poses. 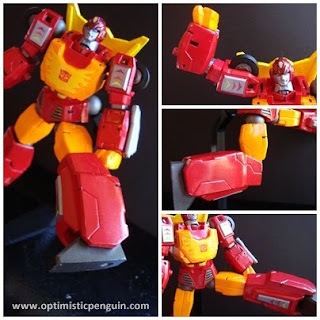 Hot Rodimus comes with a standard Yamachuchi stand, which is a V shaped base with two pegs sticking up to either plug into the feet of the figure or to plug into the curved pole of stand, which has a Revoltech ball hinge joint at the top to slot into the figures rear. I find it amusing that the hole in figure to attach to this is on its bottom. It is a good base/stand. 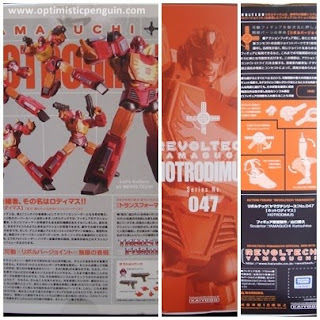 Hot Rodimus comes in the standard Yamaguchi box, with a viewing window on the front of box to see the figure, information detailing the Revoltech joints on the side, on the other side a picture of the figure, and on the back information and pictures of the figure posing with accessories. 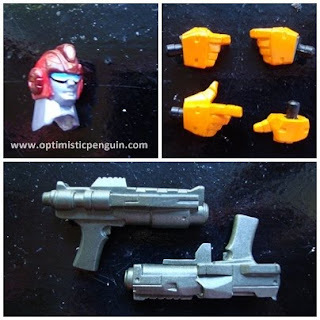 Inside the box he is held between two moulded pieces of plastic, with a space for his extra hands and guns. His stand came in plastic bags attached to the back of her casing. This is standard packaging for the Revoltech line. Also take note of the authorized sticker, each figure should have one. 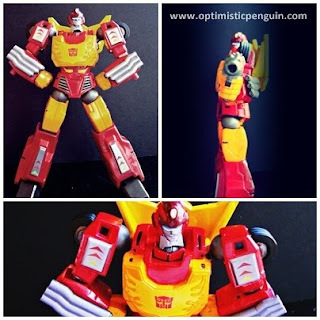 Hot Rodimus comes with an extra head with a staunch facial expression, four extra hands, two for holding weapons, one pointing and one doing thumbs up. He also comes with two hand guns. As I said before I am not really a fan of Mecha’s and this is my first, but he is pretty cool. He is small and my Fraulein Revoltech tower above him, see this image. But I see this as presenting possibilities for fun scenarios. His posability is great so in spite of me not being a particular fan of his type of figure, I can see myself enjoying him none the less. 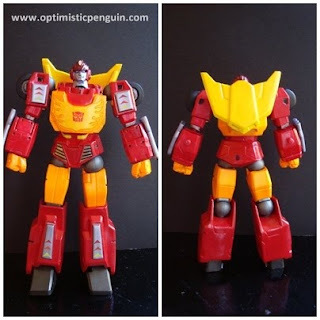 Over all Hot Rodimus is a nice figure, he is little, very posable, and has rather a lot of character, as for recommendation, I say go for it if you are transformers fan or if you are just a Revoltech fan.